Growth or Fixed Mindset: Should I Forgive? I’ve been studying a lot about fixed mindset and growth mindset for the educational coaching that I do. Fixed mindset says that you are born with a certain intelligence and certain abilities. Growth mindset says that your intelligence and abilities can be grown with effort. The growth mindset is based on scientific findings of how much the brain can grow–in any area–with effort. As a person, I have limited myself in other areas. (I’m not athletic. I’m not a math person, etc.) If you want to learn more about these mindsets, here’s a 2-minute video by John Spencer. If you want to dig a little deeper, here’s an 8-minute video by Train Ugly. Here is a quick quiz to check your mindset. In a relationship, the Growth Mindset wants to understand, forgive, and move on. My point here is not learning how to draw or do math but the fact that I believe God wants us to have a growth mindset. Spiritual maturity is all about learning not only to forgive but to live in a state of forgiveness where we forgive, as Jesus did on the cross, without being asked for forgiveness. I believe this is a life-long process of learning that we can aspire to if we have a growth mindset. I’m am not saying it’s easy; just important. I don’t really want to get into the last part of this verse, but lets take a long look at the “If” portion. If I understand the tense it is written in (Second Aorist, Active, Subjunctive) it means that we are to forgive when and if we have occasion to forgive–in other words when there is an offense against us. Forgiveness means to cut off, to send away, to set free, to cancel a debt. Forgiveness does not mean that you are disregarding sin and doing nothing about it, but you are liberating a person from them, their guilt, and their power (Zodhiates). Normally we think about forgiveness like this in terms of God forgiving us. But it seems we have two choices here: 1) We can nurture our hurt and anger with the result that it interferes with our relationship with God, or 2) We can forgive and let it go. Nurturing implies paying attention to something, caring for it, and feeding it. This means that you are often pulling your list(s) of offenses off the shelf and meditating on them instead of meditating on God’s will or God’s Word. I would much rather cut the gum-like offense off of me and free myself from its tyranny over me and my spiritual and emotional well-being. We are never more like God than when we forgive. I’m not saying it’s easy. But it is God’s way. When I was a new Christian I soon learned about forgiveness, but did not understand HOW to forgive. I read books and looked for ways to forgive a certain individual in my life. I remember reading about someone who wrote down all the offenses that someone had made against her and then burned them. I thought, “If it worked for her, it can work for me.” I grabbed a notebook and began writing page after page of offenses. (Doesn’t this sound more like nurturing than cutting off?) After I burned it, I kept thinking of other offenses to add to the list. I would have had to maintain a perpetual fire to deal with it. *chuckle* It interfered with my relationship with a forgiving God. I honestly believed in forgive and forget, but I couldn’t forget, and that’s because I didn’t understand my enemy. Sometimes my life and interests seem so fragmented and even random. I did the diagram below to try to make some sense out of my life and see where strands come together. One thing leads to another, for example I’m doing a deep study on the book of Isaiah, which leads me to a course on Bible Arcing where you connect the propositions in the verses with one of 18 Logical Relationships to help with the understanding of Scripture. I’M TERRIBLE AT IT! I mean it’s kind of frightening how bad I am at it. This led me to apply what I know about Growth Mindset to my work. I remind myself that I’m not good at this, YET! One powerful tool that has come out of this is that I am now learning the Pomodoro Method, which is a simple, but effective method of keeping you focused and on track in your learning. All of this came out of the diagram I made–My Life as a Metro System–to help me to perhaps see and understand God’s purpose for my life and my desire to study Scripture well. I’m not saying that I understand His purpose, but I am loving digging deeper into the Scriptures. Unknown Beauty: The closer you look, the more you see. My friend, Vicki, and I Facebook Message back and forth while we each have our morning quiet time/devotional/Bible study/prayer time, encouraging each other in our study, sharing books we’ve found on Amazon (You should see our Wishlists! ), and yesterday encouraging one another to take a Bible course. I just finished the first module on Bible Arcing, which is a method of looking at the Scripture and coding it relationally to see the flow of God’s Word throughout the Bible and better understand it. I’d been using Howard Hendrick’s method of Bible Study, but Bible Arcing is Hendricks on steroids. The course is only $10 and is a real strain on (my) brain, but I can only see marvelous things coming out of it for my study of Isaiah. Just wanted to share the joy. Finally, I Can Cross This Off My To-Do List! 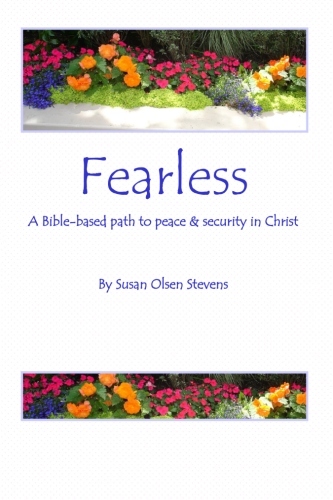 When I published Fearless on Kindle in 2013 soon after publishing it on Create Space, I just assumed that it would format correctly as I had it in the paper version. In 2015 I found out that it was full of formatting errors on Kindle. Reformatting Fearless for Kindle has been on EVERY to-do list I’ve made since then, and I finally spent three days getting it right. It is now formatted correctly. It is available for purchase on Amazon for $5.99. If you purchased it previously, improperly formatted, please let me know and I will see if I can figure out how to e-mail you the correctly formatted version for free. For many years, I thought this verse meant if we just kind of sit and wait patiently, without striving, God would renew our strength to help us get through those tough times when we are worn down to nothing. The word wait, qavah, means to bind together by twisting. When we bind ourselves together with the Lord by twisting, He renews our strength. Renew written in the tense it is written, the Hiphil Imperfect, means that God will exchange our strength for His. It is through the binding together that this happens.